Common Name : Finger Millet, African Millet. Habitat : It is widely cultivated throughout south india. Uses : The grains are sweet, acrid, bitter, astringent, cooling, diuretic, depurative and tonic. They are useful in vitiated conditions of pitta and kapha, burning sensation, hyperdipsia, strangury, renal and vesical calculi, leprosy, pneumonia, smallpox, skin diseases and general debility. 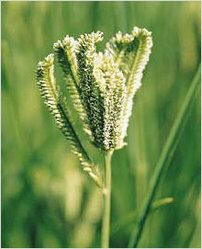 Finger millet contains 6-11% protein content. It contains fat, carbohydrates, calcium, phosphorus, iron, vitamin B1, nicotinic acid, tryptophane, lysine, histidine, arginine, cystine and methionine. It reduces plasma cholesterol, serum cholesterol, LDL, triglycerides and increases the HDL, which is an ideal diet for people suffering from high cholesterol, heart diseases and obesity. It is used in cakes, puddings, porridge etc.